Not to be confused with HMS Trepassey, Trepassey Bay, Trepassey Island, or Trepassey railway branchline. Trepassey (46°44.2′N 53°21.80′W﻿ / ﻿46.7367°N 53.36333°W﻿ / 46.7367; -53.36333), is a small fishing community located in Trepassey Bay on the south eastern corner of the Avalon Peninsula of Newfoundland and Labrador. It was in Trepassey Harbour where the flight of the Friendship took off, with Amelia Earhart on board, the first woman to fly across the Atlantic Ocean. 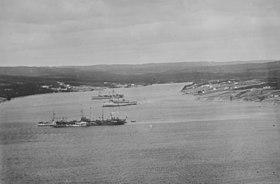 U.S. Navy ships in Trepassey Bay, May 1919. Trepassey originates from the French word trépassés (dead men), named after Baie des Trépassés on the Brittany coast of France. It is believed[by whom?] that it acquired this name due to the many shipwrecks that have occurred off its coast. Trepassey is the name of the harbour, the bay and the community. Later the translation was used as 'Dead Man's Bay' due to the tragic shipwrecks along the coast. Alternatively[according to whom? ], the 'tre' element of the name could come from the Welsh word for 'town', explained by the Welsh influence of the Vaughan family. French explorer Jacques Cartier passed through Trepassey Bay during his second voyage of exploration in 1536. Later, French, Spanish and Portuguese lived and fished near the area. Early English settlement attempts failed, and it was not until the latter part of the 17th century that the French settled the area. In 1702, during The War of The Spanish Succession, Commodore John Leake of the Royal Navy entered the harbour as part of a large naval expedition aimed at raiding numerous French settlements. Leake captured many French fishing ships and attacked French fishing stations, destroying them and driving the French from Trepassey. Until the Treaty of Utretch was signed, Trepassey was the sole settlement where English and French borders in Newfoundland met. Later fishermen from the West Country of England arrived, to be followed by large numbers of Irish and by the 1770s the Irish formed the majority of the population. In the decades following the Second Word War, the fishing industry boomed in Trepassey, and the town became increasingly affluent and successful. However, the community's golden age came to an end in 1991 with the closing of the local fish plant, putting hundreds out of work, and forcing many families to move to other areas in search of employment. The fish plant's closure inflicted a bitter economic wound on the town from which it has still not recovered. Salmon and trout fishing in the bay, nearby lakes and rivers. Caribou and other wildlife are often sighted near town along the road. Trepassey features a museum with artifacts from Amelia Earhart's flight. Cape Race lighthouse is nearby. Capelin fish beach themselves yearly in mid-July, which is also a good time to spot whales feeding on the capelin. One can also collect capelin on the beach at this time. 1504, Trepassey first appears on European maps as a supply depot. It becomes known to early Portuguese explorers as "Rio das Rosas" or "River of Roses". Trepassey, from the reign of Henry VIII and onward, becomes a port for English fishing fleets on the Grand Banks to resupply before returning across the Atlantic. 1500s, several stone foundations were laid for small dwellings where Spanish and Portuguese fishermen supposedly dried their catches. 1536, On the return to France from his second voyage of exploration to the New World, Jacques Cartier sails across Trepassey Bay. 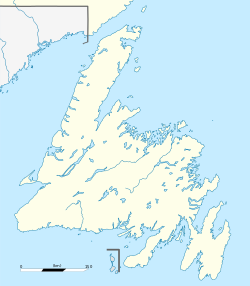 1600s, Trepassey marks the area where the French and Welsh areas of influence in Newfoundland meet. 1617, first attempt to settle Trepassey by Sir William Vaughan, who supposedly established a small plantation on the large island separating the harbour from the bay. Vaughn also supposedly wrote his famous publication The Golden Fleece from his manor in Trepassey. 1618, Vaughan and his colonists return to England and Wales, after brutal weather conditions force the abandonment of the settlement. 1619, After Vaughan's return to England, Sir Richard Whitbourne unsuccessfully attempts to revive settlement plans for Trepassey. 1620s-50s, The French become the first to settle the area, calling it "La Baie des Trépassés" or "Bay of Souls", possibly because of the quick deaths of many colonists due to starvation and the cold winter months. Over time, the word "Trépassés", due to its phonetic nature, became Anglicized into "Trepassey". Samuel de Champlain wrote of how the useful the settlement was for catching and drying fish. 1620s, Buccaneer Sam Westover, angry at not being able to intercept Spanish Treasure Ships, is said to have entered and sacked the harbour, plundering and murdering its population. It is said that he was stuck in the harbour for over a week due to unfavorable tides and winds. When he finally saw his chance to escape from the harbour during a storm, the extremely rough seas outside the Reach drove his ship onto the rocks, sinking it. 1652, The English, after settling the area at an unknown time, live side by side with the French. 1667, after constantly mounting tension, the French lay siege to the English in Trepassey. The English, however, expected such an attack, and immediately evacuate the settlement. 1660s, the French are besieged by the English and order is restored in Trepassey. 1675, the French occupy one part of the Trepassey harbour and the English the other side. 1670s, the Periman or Perriman brothers from North Devon, arrive in Trepassey and operate a successful fishing plantation. 1681, the French, recently after taking control of the harbour for the second time, prohibit the Basques from fishing in or near Trepassey. 1702, by order of King William III, Commodore John Leake heads for Trepassey as part a series of English raids along Newfoundland's coast. He sails with a fleet of English warships, including the Man-of-War, HMS Exeter. Leake had learned of several French fishing ships in Trepassey from the English colonists in Bay Bulls. Leake captures not only the French ships but also destroys multiple French fishing stages, effectively driving the French from Trepassey once and for all. 1713, the Treaty of Utrecht gives complete control of Newfoundland to England, now known as Britain. 1720, on 21 June, the pirate Bartholomew Roberts approaches Trepassey, finding 172 merchant and fishing ships at anchor. Despite the ships having about forty cannons of various size between them, Roberts takes command of the harbour without opposition. Within the span of a week, his crew massacre an unknown number of sailors and civilians. He then burns 22 of the vessels and commandeers a brigantine from Bristol, before departing. 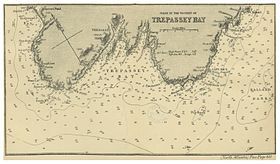 1767, Trepassey Bay is surveyed and mapped by the famed British cartographer end explorer, Captain Cook. 1779, worried by the presence of Continental privateers just off the coast during the American Revolutionary War, the citizens of Trepassey, who are fiercely loyal to the British, petition the construction of a coastal artillery battery. During the battery's construction, a force of some 15 British redcoats and the former British East India Company ship, HMS Proteus, which provides cannons for the battery, temporarily guard the harbour from attack. Other coastal batteries constructed at about the same time along the Southern Shore included St Mary's, Renews, Port Kirwan, Ferryland and Bay Bulls. 1784, the Royal Artillery removes the cannons from Trepassey's battery. 1796, the citizens of Trepassey are stirred by news coming from St. John's, telling of a considerably large French attack planned for Newfoundland, and make haste in petitioning the British for the rebuilding of the coastal battery. 1813, Trepassey's battery is refitted with two 9-pounder cannons. 1815, Trepassey's battery falls out of use at the end of the Napoleonic Wars. The beginning of Britain's "Imperial Century" sees the population of Trepassey and all of Newfoundland rise significantly. 1821, the first lighthouse is built at Cape Pine, the southernmost point in Newfoundland. 1836, the population is listed as 247. 1837, at the same time as the garrisons at Forts Townshend and William in St. John's, the citizens of Trepassey celebrate the ascension of Victoria, Princess Royal to the British Throne. 1858, Trepassey plays center stage in an incident which almost sparks war between Britain and the Spanish Empire, when a shipwrecked Spanish captain has his cargo confiscated and sold by the local magistrate and is unlawfully arrested and held for a long period of time. Upon being brought to court, during his swearing in, the Captain reportedly utters "Damn the Queen." as opposed to "God Save the Queen". His release is eventually negotiated by the Spanish Consul in St. John's, though the questionable intentions of the Trepassey Magistrate are never investigated further. 1881, the ship Jane Hunter sinks in Trepassey Bay. Locals claimed to see its ghost sailing in and out of the harbour at midnight until the wreck site was blessed by the local priest. Apparitions reportedly continue to this day, as every stormy night, the ghostly vessel is said to sail into the mouth of the harbour. 1886, the Way or Post, office closed. 1898, Trepassey-born William Fewer, a boatswain on board the USS Maine is killed when the vessel explodes at anchor in Havana Harbour, igniting the Spanish–American War. The cause of the explosion remains unknown to this day. 1914, the Newfoundland Railway Branch Line is completed, linking Trepassey with St. John’s. 1919, United States Navy Curtiss Flying Boats (the NC-1, NC-3 and NC-4) leave Trepassey harbour on May 16; NC-4 flies to Portugal via the Azores, thus completing the first successful (although not non-stop) transatlantic flight. 1928 (June 28), after staying in Trepassey for three weeks, Amelia Earhart as a passenger aboard the Friendship, becomes the first woman to fly across the Atlantic Ocean. 1969, the community elects its first town council. 1991, the local fish plant closes putting over 600 people out of work. ^ Botting, Douglas (1978). The Pirates. Alexandria, Virginia: Time-Life Books. pp. 164–165. ISBN 978-0809426508. This page is based on the Wikipedia article Trepassey; it is used under the Creative Commons Attribution-ShareAlike 3.0 Unported License (CC-BY-SA). You may redistribute it, verbatim or modified, providing that you comply with the terms of the CC-BY-SA.